It’s 3:30 p.m. on a Saturday – do you know where your customers are? Beacon technology is opening up avenues for retailers to build new relationships with their customers by interacting with them in-store and in real time. You can use user tracking and engagement to push unique, in-store promotions, create a personalized relationship with your customers through mobile communication, and collect valuable data about how your customers use your brick and mortar locations. Toronto retailers like HBC, Nordstrom, Starbucks, and others have all successfully integrated beacons into their in-store applications in a variety of ways, especially as a way of accessing more information about products. Four out of five customers already use mobile phones to inform their purchasing decisions while they are in-store; the technology makes it easier to give customers what they already want and put a better brand on your mobile presence. App development companies are racing to build solutions that are flexible and personable, while Toronto’s Clearbridge Mobile has also developed a solution that can be easily integrated into your existing CRM like Salesforce. If you’re not sure how the technology works, one of the simplest marketing tools it makes available is the ability to use location-based marketing. 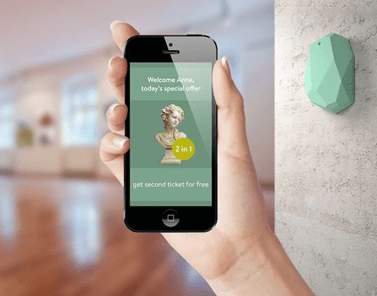 Beacons located physically in-store push notifications such as promotional campaigns when a customer approaches it or spends a significant amount of time near it (i.e., browsing a particular item). Relationship marketing is all about personalizing your campaign to the customer and creating a long-term relationship, rather than just persuading customers to make that single purchase. Data is essential to establishing and maintaining these relationships, as it can help you read and understand shifting customer behaviors and their likes and dislikes, which is why Clearbridge Mobile app development services in Toronto give their customers with an easy way to push their data into their CRM. Currently, market experts predict mobile purchases to account for $3.2 trillion next year, and a significant proportion of that number will belong to purchases made in store but via mobile. Beacons enable users to browse the store, find what they want, and walk out with their purchases without having to pull out a wallet or a credit card. The division between digital and brick and mortar sales is quickly evaporating, and the best retailers have already figured out that they’re two symbiotic parts to the same experience. Nordstrom, an upscale department that only recently launched its first Toronto location in the Eaton’s Centre, uses beacons to bridge that gap. As any of their customers pass by their locations, they receive a notification if the store has an item in their digital shopping bag in stock. That lets customers know they can make their purchase right away, without having to wait for a delivery. Data is in the driver’s seat when it comes to retail, which is why beacon solutions like Clearbridge Mobile’s Vuetrx are integrated to your Salesforce CRM through the Heroku Cloud platform. The system requires just the push of a button to deploy your newly-gathered customer intelligence to Heroku, putting more power into your CRM. If you’re ready to fuse the digital and in-store experience of your brand together, BLE/beacon systems are waiting for you.